In April 2017 Thunderbird released its successful Extended Service Release (ESR) version 52. This release has just seen it’s fifth “dot update” 52.5.0, where fixes, stability and minor functionality improvements were shipped. Thunderbird 57 beta was also very successful. While Thunderbird 58 is equally stable and offers further cutting-edge improvements to Thunderbird users, the user community is starting to feel the impact of Mozilla platform changes which are phasing out so-called legacy add-ons. 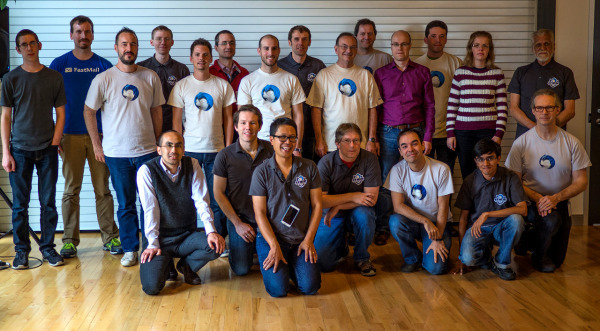 The Thunderbird technical leadership is working closely with add-on authors who face the challenge of updating their add-ons to work with the Mozilla interface changes. With a few usually simple changes most add-ons can be made to work in Thunderbird 58 beta. https://wiki.mozilla.org/Thunderbird/Add-ons_Guide_57 explains what needs to be done, and Thunderbird developers are happy to lend a hand to add-on authors. There has been some discussion about the modernisation of Thunderbird’s user interface. Thunderbird 57 is now following Mozilla’s Photon design, and there is also a new theme available based on the design by the Monterail team. You can download the current Thunderbird beta here. Since November 2016 the Thunderbird project has contracted the services of long-time Thunderbird volunteer contributor Jörg Knobloch. Since Jörg moved from being a volunteer to being a contractor, his focus has changed from chasing his favourite pet-hate bugs to taking on responsibility for the product. As the continuous integration engineer, he guarantees that Thunderbird Daily is always in sync with Mozilla core changes to keep Daily in a working order. Jörg manages all code for releases (beta and ESR) and monitors regressions as reported at BMO. As a Thunderbird and Mailnews peer he reviews the work of others and is part of the Engineering Steering Committee which is in charge of the code base. In March 2017 Andrei Hajdukewycz joined the project. Andrei is the project’s infrastructure engineer. He’s been working on transitioning the project from using Mozilla infrastructure to procuring its own. He administers all the websites used by the project. There are many: Thunderbird.net*), the ISPDB, websites for telemetry, updates and release notes. And last not least: Add-ons. Soon Thunderbird add-ons will transition to Thunderbird’s own add-ons site. Watch this space! In June 2017 Tom Prince joined the project as a build and release engineer. He makes sure that we can always build Daily, beta and ESR in en-US English and all localisations. He also helps out when diagnosing test and other miscellaneous failures. Most recently Tom has been migrating the Thunderbird build system from Buildbot to TaskCluster to future-proof this aspect of the project. The project’s last hire in December 2017 has been Ryan Sipes (the guy posting this) as Community Manager. His task is to organise the community of voluntary contributors including add-on authors, spread the good news about Thunderbird, engage with donors to guarantee a solid income stream and be in touch with Thunderbird users. The Thunderbird project has taken control of the Thunderbird.net domain, of which the project will make increasing use. The www.thunderbird.net domain is being updated to be more helpful to users and eventually become Thunderbird’s home on the web. The in-product Thunderbird start page has already been served via this domain for several months. And, the members of the Thunderbird Council have received email accounts @ thunderbird.net, powered by FastMail, a gift that we are very grateful for. The investigations on Thunderbird’s future home have concluded. The Mozilla Foundation has agreed to serve as the legal and fiscal home for the Thunderbird project, but Thunderbird will migrate off Mozilla Corporation infrastructure, separating the operational aspects of the project. I’ve seen some characterize this as Mozilla “dropping” Thunderbird. This is not accurate. We are going to disentangle the technical infrastructure. We are going to assist the Thunderbird community. This includes working with organizations that want to invest in Thunderbird, several of which have stepped forward already. Mozilla Foundation will serve as a fiscal sponsor for Thunderbird donations during this time. To investigate potential new homes for Thunderbird, Mozilla commissioned a report from Simon Phipps, former president of the OSI. The Phipps report saw three viable choices for the Thunderbird Project’s future home: the Software Freedom Conservancy (SFC), The Document Foundation (TDF) and a new deal at the Mozilla Foundation. An independent “Thunderbird Foundation” alternative was not recommended as a first step but the report said it “may become appropriate in the future for Thunderbird to separate from its new host and become a full independent entity”. Since then the Thunderbird Council, the governing body for the Thunderbird project, has worked to determine the most appropriate long term financial and organizational home, using the Phipps report as a starting point. Over the past year, the Council has thoroughly discussed the needs of a future Thunderbird team, and focused on investigating the non-Mozilla organizations as a potential future home. Many meetings and conversations were held with organizations such as TDF and SFC to determine their suitability as potential homes, or models to build on. In parallel, Thunderbird worked to develop a revenue stream, which would be needed regardless of an eventual home. So the Thunderbird Council arranged to collect donations from our users, with the Mozilla Foundation as fiscal sponsor. Many months of donations have developed a strong revenue stream that has given us the confidence to begin moving away from Mozilla-hosted infrastructure, and to hire a staff to support this process. Our infrastructure is moving to thunderbird.net and we’re already running some Thunderbird-only services, like the ISPDB (used for auto configuring users’ email accounts), on our own. Thus, much has changed since 2015 – we were able to establish a financial home at the Mozilla Foundation, we are successfully collecting donations from our users, and the first steps of migrating infrastructure have been taken. We started questioning the usefulness of moving elsewhere, organizationally. While Mozilla wants to be laser-focused on the success of Firefox, in recent discussions it was clear that they continue to have a strong desire to see Thunderbird succeed. In many ways, there is more need for independent and secure email than ever. As long as Thunderbird doesn’t slow down the progress of Firefox, there seems to be no significant obstacles for continued co-existence. We have come to the conclusion that a move to a non-Mozilla organization will be a major distraction to addressing technical issues and building a strong Thunderbird team. Also, while we hope to be independent from Gecko in the long term, it is in Thunderbird’s interest to remain as close to Mozilla as possible to in the hope that it gives use better access to people who can help us plan for and sort through Gecko-driven incompatibilities. We’d like to emphasize that all organizations we were in contact with were extremely welcoming and great to work with. The decision we have made should not reflect negatively on these organizations and we would like to thank them for their support during our orientation phase. The Thunderbird Council and the Mozilla Foundation executive team maintain a good working relationship and make decisions in a timely manner. The Thunderbird Council and the team make meaningful progress in short order on operational and technical independence from Mozilla Corporation. Either side may give the other six months notice if they wish to discontinue the Mozilla Foundation’s role as the legal and fiscal host of the Thunderbird project. Mozilla would invoke C if A+B don’t happen. If C happened, Thunderbird would be expected to move to another organization over the course of six months. From an operational perspective, Thunderbird needs to act independently. The Council will be managing all operations and infrastructure required to serve over 25 million users and the community surrounding it. This will require a certain amount of working capital and the ability to make strong decisions. The Mozilla Foundation will work with the Thunderbird Council to ensure that operational decisions can be made without substantial barriers. If it becomes necessary for operational success, the Thunderbird Council will register a separate legal organization. The new organization would run certain aspects of Thunderbird’s operations, gradually increasing in capacity. Donor funds would be allocated to support the new organization. The relationship with Mozilla would be contractual, for example permission to use the trademark. The Thunderbird Council is optimistic about the future. With the organizational question settled, we can focus on the technical challenges ahead. Thunderbird will remain a Gecko-based application at least in the midterm, but many of the technologies Thunderbird relies upon in that platform will one day no longer be supported. The long term plan is to migrate our code to web technologies, but this will take time, staff, and planning. We are looking for highly skilled volunteer developers who can help us with this endeavor, to make sure the world continues to have a high-performance open-source secure email client it can rely upon. Thunderbird Active Daily Inquiries Surpass 10 Million! 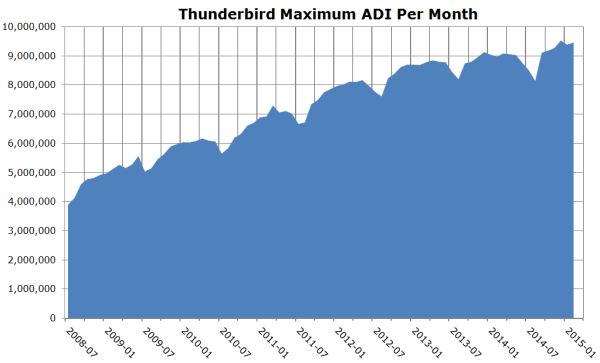 We are pleased to report that Thunderbird usage, as reported though the standard Mozilla metric of Active Daily Inquiries (ADI), has surpassed 10 million users per day on Monday November 30 2015 for the first time ever. ADI is a raw measurement of active users, and is taken by counting the daily requests from Thunderbird users for updates to the plugin blocklist. This measure under-counts active users for a variety of reasons (such as firewalls, or users that do not use Thunderbird everyday). Based on more detailed studies with other applications, a typical multiplier applied to ADI to estimate total active users is 2.5. So the best estimate of current active users is 25,000,000. Eleven years ago, on December 7 2004, Mozilla announced in a blog post the birth of Thunderbird. Happy Birthday, Thunderbird! The Thunderbird development team is working hard on the next major release of Thunderbird, version 45, which is due for release in March of 2016. String freeze for new features is this weekend. Over 1000 code commits have been done to the main Thunderbird code repository in preparation for this release (in addition to the tens of thousands of commits to the Mozilla platform repository that Thunderbird uses as its base). Coincidentally on the same date as the new ADI record, in a post to a public Mozilla discussion forum, Mozilla Chairperson Mitchell Baker outlined some upcoming changes in the relationship of Mozilla to Thunderbird. In the administrative part of that post, Mitchell announced that the Mozilla Foundation under Mark Surman has been working with Thunderbird to provide at least a temporary legal and financial home for the Thunderbird project (which we have been sorely lacking for several years). At the same time, a formal process will be undertaken to determine what is the best long-term home for Thunderbird, which might be Mozilla or might be some other entity. Practically what this means is that in 2016, Thunderbird will finally be able to accept donations from users directed toward the update and maintenance of Thunderbird. In the long run, Thunderbird needs to rely on our users for support, and not expect to be subsidized by revenue from Firefox. We welcome this help from the Mozilla Foundation in moving toward our goal of developing independent sources of income for Thunderbird. In the technical part of that post, Mitchell reiterated that Mozilla needs to be laser-focused on Firefox, and that the burden this places on Thunderbird (as well as the burden that Thunderbird places on Firefox) is leading to unacceptable outcomes for both projects. The most immediate need is for the Thunderbird release infrastructure to be independent of that used by Firefox, and Mozilla has offered to help. In the long-term, there will be additional technical separation between Firefox and Thunderbird as a continuation of a process that has been ongoing for the last three years. Thunderbird and end-to-end email encryption – should this be a priority? In the last few weeks, I’ve had several interesting conversations concerning email encryption. I’m also trying to develop some concept of what areas Thunderbird should view as our special emphases as we look forward. The question is, with our limited resources, should we strive to make better support of end-to-end email encryption a vital Thunderbird priority? I’d appreciate comments on that question, either on this Thunderbird blog posting or the email list tb-planning@mozilla.org. 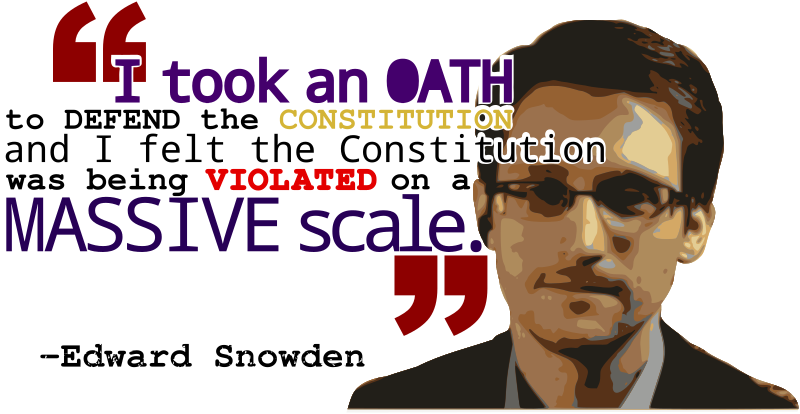 In one conversation, at the “Open Messaging Day” at OSCON 2015, I brought up the issue of whether, in a post-Snowden world, support for end-to-end encryption was important for emerging open messaging protocols such as JMAP. The overwhelming consensus was that this is a non-issue. “Anyone who can access your files using interception technology can more easily just grab your computer from your house. The loss of functionality in encryption (such as online search of your webmail, or loss of email content if certificates are lost) will give an unacceptable user experience to the vast majority of users” was the sense of the majority. So in summary, the problem is much bigger than the average person realizes, and other email vendors don’t care about it. There are several projects out there trying to make encryption a more realistic option. In order to change internet communications to make end-to-end encryption ubiquitous, any protocol proposal needs wide adoption by key players in the email world, particularly by client apps (as opposed to webmail solutions where the encryption problem is virtually intractable.) As Thunderbird is currently the dominant multi-platform open-source email client, we are sometimes approached by people in the privacy movement to cooperate with them in making email encryption simple and ubiquitous. Most recently, I’ve had some interesting conversations with Volker Birk of Pretty Easy Privacy about working with them. Should this be a focus for Thunderbird development? Calendaring is now shipped by default. This continues to be implemented as the Lightning extension, but that is now enabled and installed by default. Chat now supports Yahoo Messenger. Messages can be filtered when sent and when archived. You can now search multiple address books. Gmail users can now authenticate using Google’s preferred OAuth2 authentication (which means that new GMail users should work with Thunderbird without special configuration). This is a significant milestone for the Thunderbird team, as it is the first release that has been fully managed by our volunteer team rather than by Mozilla staff. Mozilla is still heavily involved with this release, as we still use Mozilla infrastructure for the build and release process. Thanks to the many Mozilla staff who helped out to fix issues! Thanks to all of the volunteers who have contributed to make this release possible! (Note that while general comments on Thunderbird 38 are welcome, please do not use the comment section of this blog as a place to make bug reports, or to request support for specific issues). Thunderbird 38 goes to beta! The next major release of Thunderbird, version 38, is now in beta and available for testing. You may download Thunderbird 38.0b1 here. We’re happy to report that Thunderbird usage continues to expand. Mozilla measures program usage by Active Daily Installations (ADI), which is the number of pings that Mozilla servers receive as installations do their daily plugin block-list update. This is not the same as the number of active users, since some users don’t access their program each day, and some installations are behind firewalls. An estimate of active monthly users is typically done by multiplying the ADI by a factor of 3. The Thunderbird team is now working hard preparing our next major release, which will be Thunderbird 38 in May 2015. We’ll be blogging more about that release in the next few weeks, including reporting on the many new features that we have added. In October 2014, 22 active contributors to Thunderbird gathered at the Mozilla office in Toronto to discuss the status of Thunderbird, and plan for the future. Thunderbird contributors gather in Toronto to plan the future. As background, Mitchell Baker, Chair of the Mozilla Foundation, posted in July 2012 that Mozilla would significantly reduce paid staff dedicated to Thunderbird, and asked community volunteers to move Thunderbird forward. Mozilla at that time committed several paid staff to maintain Thunderbird, each working part-time on Thunderbird but with a main commitment to other Mozilla projects. The staff commitment in total was approximately one full-time equivalent. Over the last two years, those individuals had slowly reduced their commitment to Thunderbird, yet the formal leadership of Thunderbird remained with these staff. By 2014 Thunderbird had reached the point where nobody was effectively in charge, and it was difficult to make important decisions. By gathering the key active contributors in one place, we were able to make real decisions, plan our future governance, and move to complete the transition from being staff-led to community-led. A group of seven individuals were elected to comprise a Thunderbird Council with the authority to make decisions affecting Thunderbird. I (Kent James) am currently the Chair of this council. Accounts: Merge the New Account Types binary addon into core, allowing new account types to be defined using addons in the future. IMAP: support OAUTH authorization in GMail. We agreed that Thunderbird needs to have one or more full-time, paid staff to support shipping a stable, reliable product, and allow progress to be made on frequently-requested features. To this end, we plan to appeal directly to our users for donations. The Thunderbird active contributors are proud to be part of Mozilla, expect to remain part of Mozilla for the foreseeable future, and believe we have an important role to play in fulfilling the goals of the Mozilla Manifesto. There is a lot of new energy in Thunderbird since the Summit, a number of people are stepping forward to take on some critical roles, and we are looking forward to a great next release. More help is always welcome though! 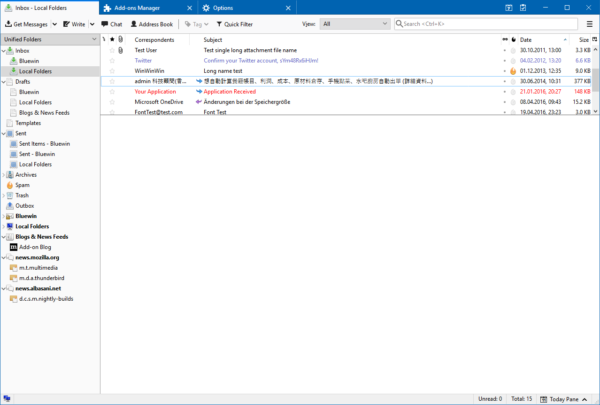 Mozilla, a global, nonprofit organization dedicated to making the Web better, today released new versions of Mozilla Thunderbird, its free and open source email application, available for Windows, Mac, and Linux. We are happy to announce that the new Thunderbird release includes several new features and improvements, such as improved message thread management options, as well as the support of email addresses using the newly adopted standard for international domain names. Thunderbird is now more accessible with the ability to magnify the compose window. This release is also comprised of many bugs and security fixes. More details can be found in the release notes. To get the latest versions of Thunderbird for Windows, Mac or Linux download Thunderbird from getthunderbird.com or go into the About dialog to upgrade to the latest version. This release of Mozilla Thunderbird comes with a new button on the right hand side, at the top of the window; called the Menu Button it provides more options to customize the user interface. The Menu Button allows users to remove the Menu Bar from the top of the window in order to grant more real estate to read and manage emails. A right click on this same Menu Button gives access to the “customize” command and entitles the user to add, remove and re-arrange many icons on the bar. It really empowers the user to build its own personal interface. Beyond this mainstream Thunderbird release and as planned, we are releasing the second Thunderbird Extended Support Release (ESR) targeted at large organizations. This ESR version is not only a security and bugs fix, but it contains all the great features that have been added to Thunderbird since January 2012. Please download here. This release is also a milestone release and marks the beginning of the new governance model for Thunderbird. As mentioned in Mitchell’s blog post back in July, “Mozilla is focusing its efforts towards important web and mobile projects, such as Firefox OS, while Thunderbird remains a pure desktop-only email client.” Therefore, we proposed “to adapt the Thunderbird release and governance model in a way that allow both on-going security and stability maintenance, as well as community-driven innovation and development for the product.”. This has been actively discussed with the community during the last few months, and now is the time to implement the plan. If you are interested in more details, please have a look at the wiki pages describing our collective work. If you are a developer, a translator or just want to join the Thunderbird project, please click on this link. Click here to download the up-to-date version of Thunderbird for Windows, Mac or Linux, or go to the About dialog and click ‘Check for Updates’.